We got one just a couple of weeks ago for £45 and I thought that was a good deal, but I just saw this on Curry's website! It will probably still has the two voucher codes inside for £20 off pods from the tassimo website so definitely worth checking! 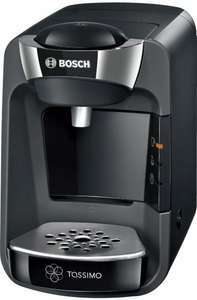 The energy efficient Bosch Tassimo Suny TAS3202GB Hot Drinks Machine is incredibly easy to use with its fully automatic capsule system. The Tassimo Suny TAS3202GB is completely automatic so all you have to do is slip in a pod, press the operation button and sit back and relax while your drink is prepared. The Suny T32 works with Tassimo T DISCs and hosts intelligent Barcode technology. The coffee machine scans the barcode on the T DISC to register brewing time, temperature requirement and the amount of water needed. You can enjoy a selection of T DISCs varieties including a range of Costa favourites, Kenco Medium Roast Coffee and Caffe Crema, Twinings Breakfast Tea and Chai Latte, Cadbury Hot Chocolate and more. The Tassimo Suny TAS3202GB boasts a sleek and compact design allowing it to fit onto almost any kitchen worktop. With its curvaceous body and high glossed finish, the coffee machine promises to catch the eye of passersby. The Suny T32 is incredibly easy to maintain too with its water level window and automatic cleaning process using the cleaning T DISCs. Enjoy your favourite drinks in the push of a button with the Bosch Tassimo Suny TAS3202GB Hot Drinks Machine in striking black. Got a T40 last Christmas and the disks were reasonably priced at around £3.00 - £3.50. 2 months later and they were all back to prices like £5 for 8 latte disks. Hopefully this Christmas the prices will drop again, then it's worth stocking up. At the moment, standard coffee pods are 25p each (£4 for 16 pods) pretty much everywhere, but lattes and cappuccinos are more expensive! Where do people normally buy their pods from? I always get mine from the tassimo web site. Have a look for vouchers on here and then order. Check the validity of the voucher first though just in case it's run out. There appears to be new money off vouchers frequently. Also free delivery over a certain value. Go to Thompsons Discount Electrical (in Worcester) and you can get a graded Tassimo Fidelia or Charmy for £29.99. I bought a black Charmy last weekend for £29.99. Or you can ring their warehouse and they will deliver next day for £7.99. Just phone them (number in link below) and ask what Tassimo machines they have left for £29.99. Reserved. Thanks Op. Been waiting for this to come down in price. Have some heat. Got a T40 last Christmas and the disks were reasonably priced at around … Got a T40 last Christmas and the disks were reasonably priced at around £3.00 - £3.50. 2 months later and they were all back to prices like £5 for 8 latte disks. Hopefully this Christmas the prices will drop again, then it's worth stocking up. must be national then cos it was in my local tesco too. Which is better a tassimo or a nespresso machine? This was my next question - I'm completely new to these machines & have ordered one. Do I need milk pods too or can I just use normal milk from the fridge? I use normal milk, milk pods are nice idea but too expensive overall! Total waste of time they are! Went through the Bespoke Beat my price rigmarole/delay but got an offer that I took them up on and today 3 or 4 days later they have said they are going to refund me as "order cancelled". No explanation as to why/how! Went to look at the original Order Acceptance and the terms etc linked from there = a broken link - argh! Anyway shalln't waste any more of my life/wallet using them ever again! Glad they've wasted so much money advertising a useless/pointless service. Seems to be out of stock for collection at most places I've tried. Back up to full price online. Thanks for this, they have plenty in the Cheltenham store.